I felt like my travel just started from Beijing, the G6 highway, even though I am on the road already one and half months and traveled to three countries. We went to Inner Mongolia first, a place that made me lots of imaginations, like grasslands, horses or Mongolians with eagles on their arm. These romantic imaginations were hardly to see from the highway. We passed through Hohhot, a “green city" which used to be with green mountains in the north, but it became one of the cement jungles of China now. I also thought it would be hard to hitchhike in such an empty place like Inner Mongolia. 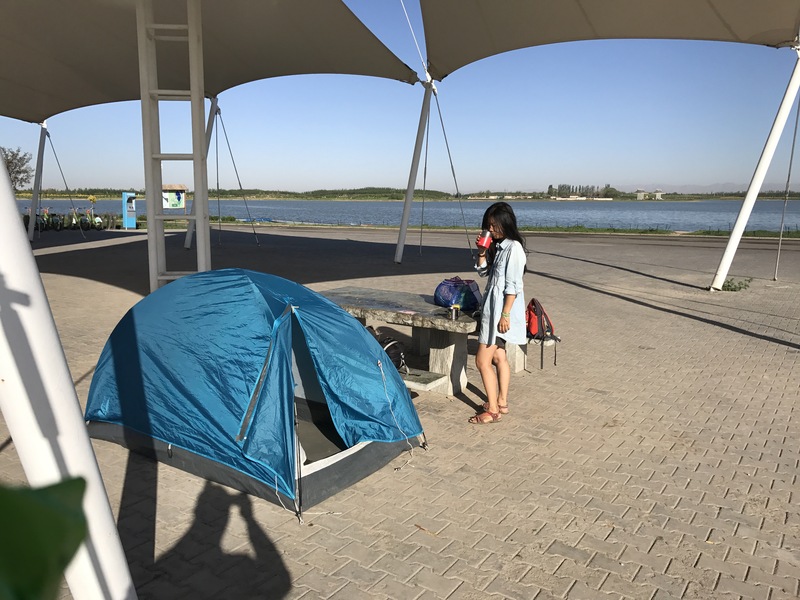 While our first stop at a service area in Inner Mongolia, two guys took the initiative and walked to us and picked us up. After dropping us on the crossroads, we took risk of walking on highway to the next petrol station and I remember how windy it was there. That night we arrived at a police station beside a toll gate and we asked the policeman for hot water to cook instant noodles. “Don’t you know here’s a police station?" One of the police officers said. “That’s why we are here, it’s the most safe place." I replied. He smiled to me. Then, they recommended us a camping site beside a lake, which was located around hundred meters from there. In the morning, I saw a very beautiful lake called Lin He(臨河). “How about we go to China directly, if the next driver we’ll stop is going there?" We had this joke at the border of Thailand and Laos. So we stopped a van and amazingly it was going to China, but we decided to stay. That day back in Wu Hai, Inner Mongolia, an empty van stopped for us. The driver had a nice moustache and he looked different from Han Chinese. He also had a strong accent. He was a Uyghur. “We are going Yin Chuang direction then heading west to Xin Jiang. Our destination is Kashgar." I explained our routes. “Oh my, could you please take us with you? Please!" I was so excited. Probably we don’t need to hitchhike anymore. Just get to Xin Jiang with one car. “Police won’t allow this." He pointed at back seat, there was only one seat. So he refused. We looked at each other few seconds and I knew he wanted to take us but I wouldn’t dare to resist China police. The Uyghur guy kindly told us that he met a group of people heading to Xin Jiang. Probably we gonna have a chance to meet them later. I was really disappointed to say goodbye to him. From there on, I looked forward to go to Xin Jiang, because he was so different from other people we have met before. After that, we got a ride to Lan Zhou with a very talkative driver. I already forgot what we were talking about during 600km ride, but it was nonstop chatting. He was sharing his life experiences with all honesty during our ride. 300km before arriving in Lan Zhou, we actually should have changed the car which would go to west, but instead of going west, we were convinced by the driver to go to Lan Zhou. So at 9 p.m. We arrived Lan Zhou, the capital of ramen noodles.